Hush puppies are a very interesting name for the fried bread that is routinely served at fish fries along side of fried fish. Southerners just can't seem to get enough of these little breaded delights. I don't know the true origin of how the name came about. The consensus among cooks is that the name refers to keeping dogs quiet. 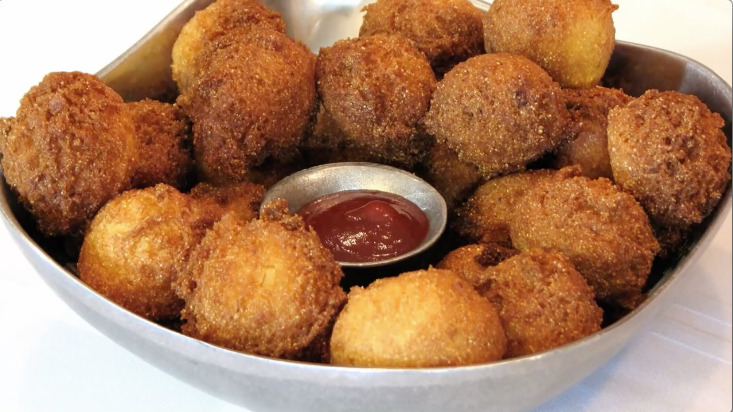 Whatever the case, the hush puppy is the side dish of choice at many fish fry's. If you get caught not serving these your guest will probably be upset. You just can't sit down at a southern table and eat fried catfish without having this breaded food favorite. Truth be told, the Hushpuppy and fried catfish go together like soap and water. You can have one without the other, but it's strongly discouraged ...just a little humor. The fried bread recipe that follows is simple to prepare and easy to cook. In a mixing bowl combine corn meal, flour, baking powder, salt and sugar. Blend in eggs and 1/2 to 1 cup milk. The batter should be thick enough to easily drop from a teaspoon into hot cooking oil. Next add finely chopped yellow onions to batter and mix thoroughly. Allow batter to set while cooking oil heats. Start off by heating vegetable oil in a deep fryer or deep skillet to 375 degrees. Add enough cooking oil to allow the hush puppies to float, about 3 inches. Drop batter by spoonfuls into the hot vegetable oil and fry until golden brown. Drain grease on paper towels and serve immediately. That's all there is to this recipe. See I told you the recipe was simple to prepare and easy to cook. This delicious hush-puppies recipe is best served with fried catfish, cole slaw and French fries.